ABJ's pictures of the lovely blue and lavendar glass vessels made me think about some of the glass objects that I have been thinking about this week... First the lovely glass acanthus drop that has to be one of my favorite Christmas gifts even though it was a package ornament. I can't get a picture that captures the sparkle and the color, so this will have to do. And I have been looking for a glass teapot that would not break the bank ever since ABJ gave me my first flower tea. Found this on sale for $9.98 at Reading China and Glass yesterday on the sale shelf. It makes a perfect 2 cups and has a cup on the bottom. And I first saw these lovely lozenge-shaped lamps in the Pottery Barn catalog about a month ago and can't get them out of my head. 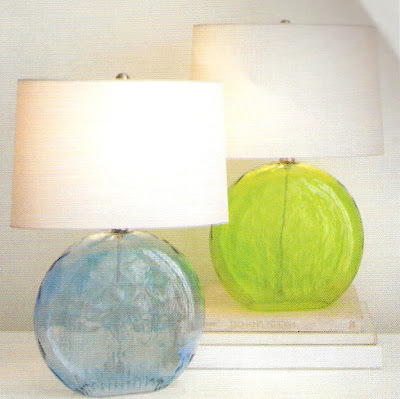 I would put them in my sun room if I had money to spare and didn't already have some nice pottery lamps already there.